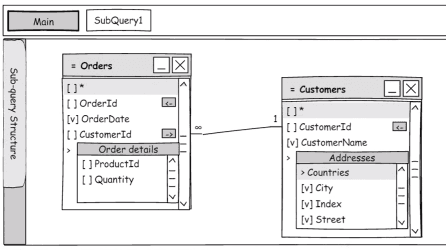 Much faster visual and programming SQL query building in the new major version! Today we announce the main improvements in the new major version that will help users and developers be more productive than before. 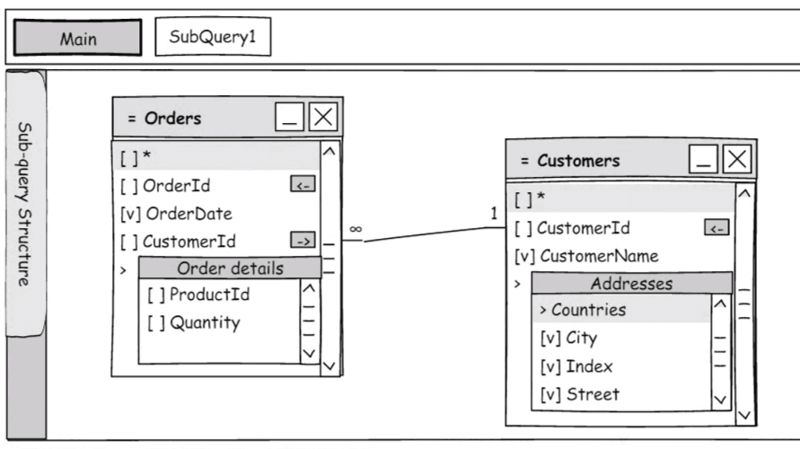 The upcoming release of Active Query Builder for .NET will be available until the end of this year. The main core change is the new serializable query object model. 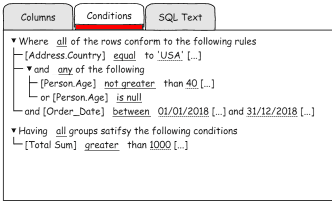 It will store every single SELECT statement the way you see it in the query text: lists for the SELECT, GROUP BY, and ORDER BY clauses and tree-like structures for the WHERE and HAVING clauses. This model will significantly ease the programmatic SQL query analysis and modification. Besides, we have made the new fluent API to build SQL queries the way close to the SQL language. It is type safe and uses the pre-generated objects from your database schema, so you get compilation errors when table or field is missing or misused. You get SQL text for any database server supported by Active Query Builder from the single query definition. It is easy to read and easy to write queries with it using the IDE auto-completion: lists of SQL functions, database objects and their fields are always at hand. 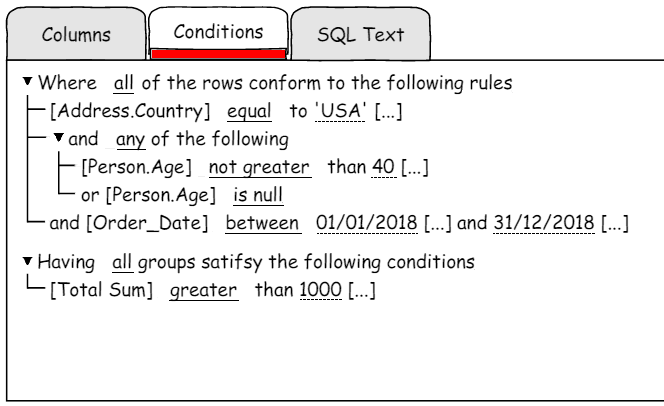 The tree-like interface to edit conditions in the WHERE and HAVING clauses will be available in all versions. You can let users define conditions in the old way, so users can gradually move on to using the new interface, as soon as they realise its advantages. 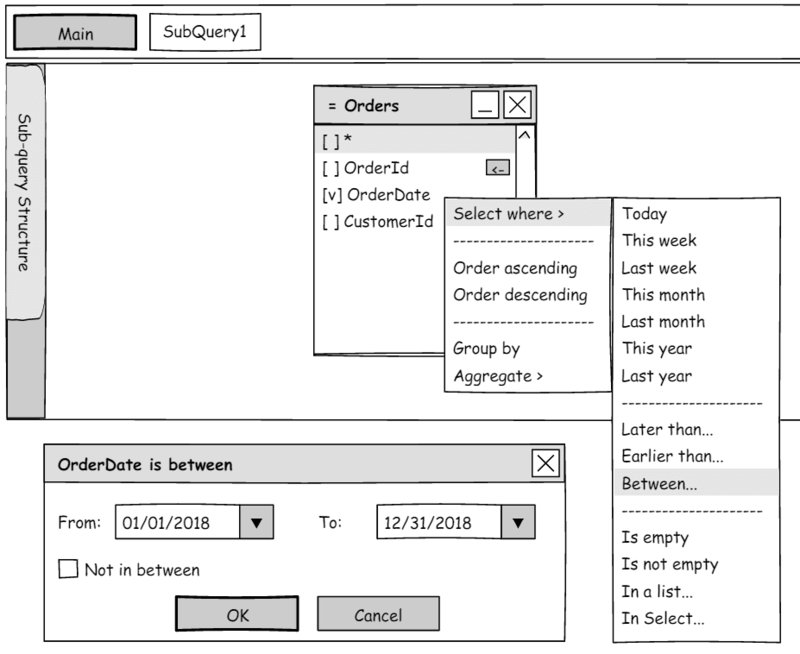 Only four columns in the Query Columns Grid will be necessary to build a query: SQL expression, Column name, Sorting and Grouping/Aggregate. 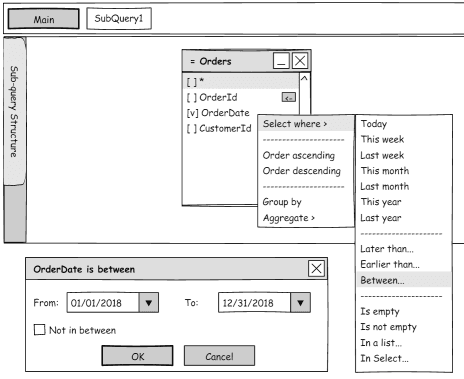 For the rest of the year, we aim to provide a more compact and clear view of SQL queries and database schema for end-users. Complex real-world entities are represented in a relational database by several tables. Assembling them in a single object on the design pane will give a more clear view of the database schema. Hiding objects which are only used to define many-to-many relationships from the Design Pane will simplify the query diagram. Users will be able to define conditions, grouping and sorting right from the Design pane. We hope these improvements will meet your expectations for a convenient query building interface. Please feel free to submit your feedback.